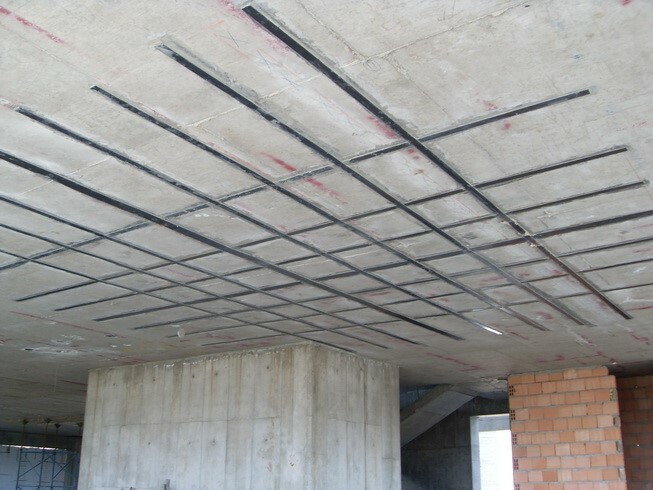 Increasing attention has been placed on the applications of the advanced composite materials especially Fiber Reinforced polymer (FRP) CTech-LLC® systems in the field of structural engineering. Extensive applications of FRP composites as construction materials have been accomplished recently. FRP CTech-LLC® composites are lightweight, high strength, non-corrosive and non-magnetic materials. There is a wide range of recent, current and potential applications of these materials that cover both new and existing structures. FRP CTech-LLC® composites have been used in many structural engineering projects and research studies. These composites have been used for strengthening reinforced concrete beams, columns and one way slabs. Researches has been conducted on the strengthening of reinforced concrete slabs, especially two-way slabs, using FRP materials. Some research dealt with the strengthening of one-way slabs using FRP materials or steel in which slabs were treated as very similar to beams. Two-way plates of low and medium reinforcement ratios are however subject to flexural failure rather punching shear failure. Hence, using FRP CTech-LLC® systems to enhance two way plates in flexure is very desirable from the practical point of view because of the ease of handling and installing FRP materials. However, the drawback of using FRP CTech-LLC® systems in strengthening of flexural structural members is the brittleness of such materials that can cause a decrease in the ductility of such members.